We have reviewed a selection of jigsaws suitable for a range of ages. Jigsaws are really enjoyable, whether done individually or as a group - few of us can resist a puzzle as we walk past! They help children develop a range of key skills and have fun at the same time. These lovely chunky puzzles are the perfect introduction to jigsaws for children of 18 months plus. Each puzzle depicts a different farm animal - pig, cow, chicken, sheep, goat, horse, duck, dog and cat. The durable puzzles are made in extra thick double laminated card. For an extra element of play and learning value, they all have themed frames, giving an additional level of challenge as children match the frame with the animal - the cow has a bell round her neck and bells feature on the frame, for example. The puzzles offer lots of opportunity for learning about farm animals and talking about them. Each puzzle measures 18 x 10cm (21 x 14.5cm in the frame) when complete - a really good size for little hands. The linen finish print minimises glare on puzzle image which is useful for young children. These are lovely brightly coloured puzzles with charming animals depicted against appealing backgrounds with little touches of humour. The frames are a lovely finishing touch. Ravensburger puzzles are carefully graded by age, and this one, with 100 pieces, is recommended for 6+. Based on the popular Netflix series, and bound to be popular with its fans, the puzzle shows Pru, Lucky and Abigail on their high-spirited horses, ready to set off on another adventure, and will be a fun challenge for spirit fans everywhere to enjoy. The picture is brightly coloured with expressive horses and riders against a striking background - they look as though they can't wait to be off on their adventure! The puzzle has a pretty floral border and this is a real asset when doing the puzzle as it makes it easy to sort out the edge pieces to begin the jigsaw. The durable puzzle, which will remain crisp and fresh through many uses, is made from strong premium grade cardboard, and the precision of the cutting makes the puzzle a joy to create. In fact, the cutting is so precise that, if you listen carefully, you can hear a gentle 'click' as the pieces are put into place: Ravensburger call this ‘Soft click Technology’. Glare on jigsaws can be annoying, but Ravensburger's linen finish minimises this. The progression of the Perfect Age Fit is really good; the overall size remains the same at 49x36cm, but the size of pieces reduces so there are 150 for 7+, 200 for 8+ and 300 for 9+; this means parents can choose puzzles perfectly targeted for their child's ability. Jigsaws are a great way to encourage children's concentration and they get such satisfaction when they are completed. This will be a great addition to any child's puzzle collection. This 24 piece puzzle is perfect for children to share and ideal for all young Thomas fans. They will love to spot their favourite engines and to remember the stories they have read about them. And then it's a great opportunity to get the books out and share storytime together. 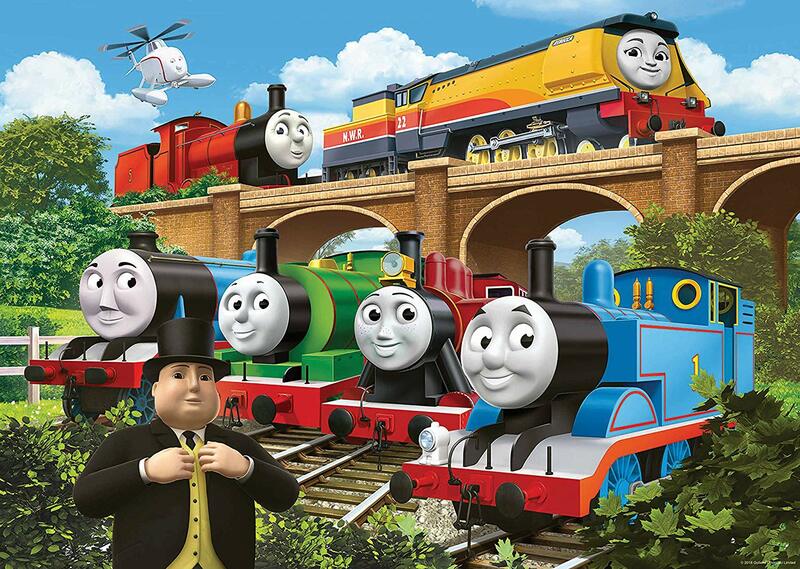 Thomas is shown in the brightly coloured picture, along with lots of other engines to welcome Rebecca (Rosie, Edward, Gordon and James), with Harold the Helicopter flying above - and the Fat Controller is looking after them all. The big pieces are ideal for small hands, click into place, and the bright colours and clarity of the images make it easy for children to find the right pieces - starting with the edges, of course! Jigsaw puzzles are a great way to have fun while encouraging observation, logical thinking, communication and fine motor skills. Adults can ask questions about the picture or encourage children to make up a story about what is happening. The finished puzzle measures 70 x 50cm when complete and is suitable for ages 3 years and up. Like all Ravensburger puzzles, it's made to a high standard from strong premium grade cardboard; the linen finish print minimises glare on the puzzle image. Another super puzzle from the much-loved Ravensburger brand. What a difference an attractive box makes! Both the Crocodile Creek puzzles are packed in attractively shaped boxes, which really makes them stand out. This Barnyard puzzle box actually reflects the shape of the completed puzzle. There are 30 thick puzzle pieces that fit together very well; the puzzle is recommended for 3+. Jigsaw puzzles offer many benefits, including shape recognition, hand-eye coordination, fine motor skills and problem solving - and all the time, children are having fun. This big floor puzzle has the added benefit of encouraging children to play together. The pieces are made of strong board that won't tear or break, and the picture is bright and vibrant; the finished puzzle measures 47x68cm. The attractive artwork features lovely friendly sheep, chickens, pigs and many more farmyard animals, all charmingly depicted. Many other superb puzzles are available in the same range, including Busy City, Dinosaur and Vehicles. A gorgeous puzzle, and one that will be used over and over again. Available from Trotters Childrenswear & Accessories. For stockists, visit www.bertoy.com/dealers. Scroll to the UK map for shop lists. Ideal for those learning about the planets at school or home, there are 72 thick puzzle pieces that fit together well; suitable for ages 6 and up. As well as the planets, the detailed colourful pictures include spaceships, stars and more - plenty to talk about and perhaps to look up and learn about too. The box is sturdily made and, unlike many jigsaw puzzle boxes, won't get crushed should it find itself at the bottom of a heap. And for easy identification, the box is labelled on the side - little things perhaps but it's the little things that make a difference. All Crocodile Creek puzzles are eco-friendly, printed with soy-based ink on recycled cardboard. This is another really attractive puzzle - in fact, it seemed a real shame to have to break it up to put it away... but there's always another time! For stockists, visit www.bertoy.com/dealers. Scroll to the UK map for shop lists. This is a really lovely box from the My First Puzzles range at Ravensburger. Each jigsaw has a chunky illustrated frame, every one is different and they all have a simple two pieces to put together. 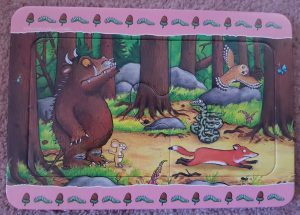 There are nine puzzles in this box and they all depict scenes and characters from the much-loved book 'The Gruffalo'. 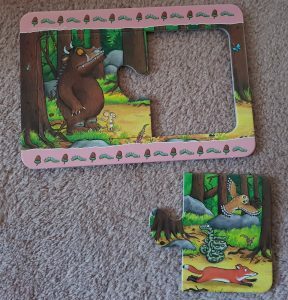 The puzzle pieces are made from super thick laminated card so there is less chance of the pieces bending or getting broken if your child is a little heavy handed with them! 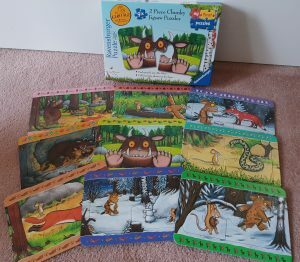 The Gruffalo - My First Puzzles are aimed at ages 18 months and over which is the perfect age to introduce pre-school children to jigsaws as they promote early learning skills. These two piece chunky puzzles retail at £8.49 and would also make great gifts. Take a look at My First Puzzles and the other products Ravensburger offer on their website. I was thrilled to be offered this for review. I love visiting stately homes, and this wonderful jigsaw encapsulates all that is so very special about our British stately homes. I can see it being a big hit with all fellow enthusiasts - and perfect to do when the weather and seasons don't allow us to get out and about so much. This highly detailed 1000 piece puzzle is the first in a series of puzzles from renowned jigsaw producer, Ravensburger, depicting enjoyable days out. It is the work of artist Andy Walker. Completed, the puzzle measures 70 x 50cm; recommended age is 12+. The puzzle is cut from strong premium grade cardboard, which is durable and ensures the puzzle will look just as good on successive makings. I get frustrated with puzzles that shine under artificial light (especially as I tend to do jigsaws on dull winter days), but Ravensburger have got the answer to that one with a linen finish print which definitely works to minimise glare on the picture. The pieces are cut accurately and fit together well, using ‘soft click technology’ which offers a great variety of shapes. The high level of detail means there are no huge expanses of one colour, which can be tedious to do; the birds, kites and more flying across the sky contribute well to this - there's even a fly-past. I really like the fact I didn't have masses of similar coloured blue to manage. The level of detail is phenomenal and makes the puzzle a real joy to do, as there's so much to look at and appreciate. There is plenty for all ages to enjoy in this puzzle - families enjoying picnics, a vintage car, boating on the lake, birds and butterflies and much more; it's enough to encourage anyone to get out visiting and enjoying our wonderful heritage. I love it! Perfect for sharing, this giant size 100 piece puzzle is definitely one for spreading out on the floor, allowing more than one child to enjoy it at the same time. Alvin and The Chipmunks are rocking and rolling with their musical instruments in this fantastic puzzle. The high quality pieces are extra large, perfect for children age 6+ to enjoy; the puzzle measures 49 x 36 cm when complete. The picture has plenty of bold blocks of colour to find and put in place relatively easily, and the graduated colour of the background is also helpful when putting the puzzle together. Of course, the puzzle is made with Ravensburger's usual attention to detail. Ever been frustrated by lights shining on the puzzle, making it hard to see? Ravensburger use a linen finish print on the high-grade cardboard to minimise glare on puzzle image; it really does work, as we tried the puzzle by artificial light with no glare problem at all. Ravensburger tell us " we pride ourselves on having the highest quality. Individual pieces are stamped with such precision that a quiet "click" can be heard when one piece is inserted in the other - this phenomenon is so unique that we have given it its own name ‘Soft click Technology.’" We can vouch for that - the pieces really do click together perfectly with no margin for error. This is so important for young children; if they can insert the pieces with confidence, then they won't get frustrated and they will really enjoy jigsaws and gain a huge sense of satisfaction. Great fun to do and a lovely picture that children will enjoy. This is no ordinary jigsaw puzzle! Going off on holiday is always exciting, but this puzzle takes it to a whole new dimension - what if the family becomes tetchy, Dad's had enough and a change of driver was required? The picture on the box shows a stressful journey in the days before satnavs and Google maps - but the puzzle inside the box shows Dad's inventive solution. There are lots of amusing and inventive details to explore and the picture is bright, colourful and detailedc. This is not a puzzle that will be quickly finished, as there is no reference point - and that's the fun of it. It's definitely one for dedicated puzzlers and if you love jigsaws, the element of mystery will really challenge you and give great satisfaction once complete. Just like all Ravensburger puzzles, the manufacture is top quality, printed in vivid colours on strong durable premium grade cardboard with clean cuts, and with linen finish print to minimise glare on the puzzle image. The finished puzzle measures 70 x 50cm when complete and is suitable for ages 12 years and up. A real challenge and great fun and very relaxing for all the family to do together. The fact it is number 19 in the series is testament to the popuarity of the concept. If you are really stuck, Ravensburger will be kind enough to send you a small print of the finished puzzle if you write to them. The artist is Geoff Tristram, who has been a highly successful professional artist and cartoonist for over 35 years; his work can be found on fine art prints, collector's plates, greetings cards, postage stamps and, of course, jigsaw puzzles. Brilliant! Not just one, but six different elephants to be slotted into place in the shaped wooden tray. This beautifully cut and vibrantly coloured wooden puzzle is From the Special Friends range. There are three layers to the puzzle - a white elephant at the bottom; orange and green elephants in the middle and green, turquoise and red at the top. Every elephant is a different shape, and they are in lovely playful poses. As little ones lift off each layer, so they reveal the baby elephants in the layers beneath. This is a lovely first jigsaw for a young child, helping to develop fine motor skills, shape recognition and observation. "George Luck have been designing and making their award winning wooden puzzles now for over thirty years. Their imaginative and innovative designs have enthralled both children and adults. They have won numerous good toy and design awards and been widely acclaimed for being both fun and educational. They are particularly famous for their multi layered puzzles and have puzzles for all ages including adults." This colourful 100 piece puzzle is perfect for children of 6+. The scene is great fun, with lots of detail to enjoy, with pirate and animal characters; it's multi-cultural too and has boy and girl pirates so everyone will be happy! It's full of entertaining detail with plenty to spot and talk about as the puzzle is created. The size is approx 50cm x 30cm and the box includes a full-size poster of the puzzle to help - younger children may like to build the puzzle onto this. The pieces are a good size, with a variety of cuts, and they all slot together well. There are no huge areas of single colour to confuse children - all the detail means there is something to identify all the individual pieces. Jigsaws are a great way to develop key skills including fine motor skills, concentration and puzzle solving, as well as encouraging discussion. A Lovely puzzle. Nickelodeon favourite Dora the Explorer stars in three colourful jigsaws, suitable for children of 5+. The three puzzles have different coloured borders so it's easy to tell the pictures apart - but we still find it is best to keep them in separate bags. Ravensburger carefully match their puzzles to children's ages, so you can choose a puzzle at exactly the right level; this is important because children are easily put off if puzzles are much to hard (or quickly bored if they are too easy). Like all Ravensburger puzzles, the cutting is top quality; the pieces fit together really well and the bright colours and clear designs make the puzzles a real joy to do. Car enthusiasts will thoroughly enjoy this superb 1000 piece Falcon de luxe jigsaw puzzle with its British classic cars including the Austin Healy 3000, Mini Cooper, Jaguar E-Type and many more. Even better, the setting is a quintessentially British palace (it's Blenheim Palace) with the Union Jacks flying and overhead the Red Arrows are flying for added atmosphere - it's the epitome of an ideal British summer scene and the detail makes you feel a part of the scene, along with all the people enjoying their day out. The very talented artist is Steve Crisp, one of Falcon’s most popular artists, and this beautiful painting is a real work of art. Falcon's close attention to detail means that the die-cut pieces fit together snugly, giving the finished picture total continuity, so it is good enough to display when it's finished - we were very reluctant to break this up as it looked so good. The finished size of the puzzle is approximately 68 x 49cm and it has been produced using a high quality cardboard to ensure every jigsaw piece maintains its original shape and creates a poster-like finish to be enjoyed. Falcon is a heritage brand who produce puzzles using the passion for excellence that they have always had. This commitment to quality means you can be sure you are getting a top-quality puzzle; one that will keep its bright colours and good fit so it can be enjoyed over and again. Another iconically British scene, this time a busy city street in the 1960s; it will take those around at the time on a reminiscent stroll down memory lane which will have you saying 'I remember...' as you spot each new thing, just as we did. This nostalgic and highly detailed painting captures the Swinging Sixties with the unusual sight of mods (on a scooter) and rockers (on a motorbike) hanging out together in harmony, while a classic car passes by waving the Union Flag out of the window and a traditional steam train passes on the viaduct overhead. Again, Steven Binks is the artist and his attention to detail is amazing and the reproduction is excellent. The finished puzzle is superb - we really enjoyed examining it in detail and enjoying every aspect. The pieces fit together well, and there are no huge expanses of one colour, which can always be rather tedious. The bright colours make it easy to spot the pieces you want but you will still need plenty of time to complete this - and passers-by won't be able to resist helping! It's a picture that will appeal to the whole family and it's great fun to work on it together. "Today's Falcon de luxe puzzles are designed and crafted with the same passion for excellence that we have always had. They celebrate Falcon's distinctive brand values of heritage and innovation. We choose only the most suitable illustrations for our jigsaws. We die-cut each jigsaw piece carefully, so when the jigsaw is completed, it looks more like a poster than a puzzle." This super puzzle by Trevor Mitchell takes a nostalgic look back at the football world - and the everyday world - of 1966. Boys are playing their own game in the park, complete with jumpers for goalposts, whilst looking on are a host of engaging characters The goal scorer has a thought bubble showing the iconic Wembley Stadium with an England crowd cheering. Dogs run around, a mother pushes a traditional pram, fathers look on (with a touch of envy, perhaps), older people watch and in the background is a 1960s street scene complete with a variety of cars - there's even a bandstand in the background to complete the idyllic English feel. It's a happy scene, with a refreshing sense of innocence - and hope. There are lots of bright colours to help when selecting pieces and as ever, the detail is fascinating to explore - as the puzzle is created, more and more comes to life. Those of us with a big puzzle collection will appreciate the picture on the side of the box, helpful when deciding which to do again - and Ravensburger puzzles are so well made and well cut that you can do them time and time again with no loss of quality. There's never any puzzle dust in the box, which is always an indicator of good cutting. The pieces fit together very well and there is plenty of variety in the shapes, which always helps. There are no huge areas of one colour - once we had put the edges together, the flowers (and they are all Spring flowers - no botanical errors here!) were the next part to tackle; even the green of the grass has variety of light and shade to help out. It's a great family puzzle too, as it will appeal to all ages. This one's definitely a winner and perfect for doing in the gaps between EURO 2016 matches. The Tower of London is one of Britain's most iconic buildings, so it's a great picture for a jigsaw. Not just one picture, though - this 1000 piece puzzle includes eight different images. They are taken from the archives of Historic Royal Palaces, who are responsible for the maintenance and upkeep of this amazing building; and your purchase of this puzzle will help support their work. The Tower of London is famous as a prison and a place of execution, for the mystery of the two little Princes, and as a world heritage site housing the famous Crown Jewels. The puzzle depicts a Guardsman on duty, a Yeoman Warder (Beefeater), The Traitor's Gate, one of the legendary Ravens, elements of The Crown Jewels, "graffiti" carved by prisoners held in the Tower and a stunning evening view of The White Tower. The puzzle includes an A4 colour leaflet showing puzzle image for reference and information about the image. As we expect from Ravensburger, the puzzle is cut to perfection - as my husband pointed out, you never get the dust residue that you find with less well-cut puzzles. The board is sturdy and the colours bright and distinctive. The variety of images mean there are lots of mini puzzles to work on at the same time, making the puzzle perfect for a family; it's a good way to bond as a family as you chat over your separate parts of the puzzle. The detail is amazing - the photos are excellent quality and the puzzle is a really good way of appreciating the wonder that is the Tower of London. A top quality puzzle, perfectly cut and with vibrant images to capture attention. This 50 piece brightly coloured giant Disney Lion Guard floor puzzle features all the favourite characters from The Jungle Book, including Mowgli, Bagheera, Baloo, Kaa, King Louie and the Bandar-log monkeys - it's perfect to tie in with the recently released film. Jigsaw puzzles are ideal for early problem solving and hand-eye coordination, and are a good way to encourage children to work cooperatively as well. This giant jigsaw puzzles has been well produced using a high quality cardboard; the pieces slit together well. It is suitable for children aged 4 and above. There's plenty of detail, and no large single-colour areas to make it hard for young ones.The generous size (100 x 70cm) makes it perfect for children working together, thus also helping communication and sharing skills. Mike the most of this lovely puzzle to encourage children to read the book and enjoy Rudyard Kipling's superlative prose. This was such an enjoyable puzzle to do. It's beautifully detailed, with several small pictures set within the frame - not as boring block pictures, but images cleverly merging into each other. This means no tedious blocks of colour, but several distinctive areas of colour which are easy to pick out and separate when laying out the pieces. There are photographs of the front of the Tudor and the Baroque Palaces and pictures of the garden, the maze, painted interiors, Henry VIII's Astronomical Clock, and The King's Beasts. 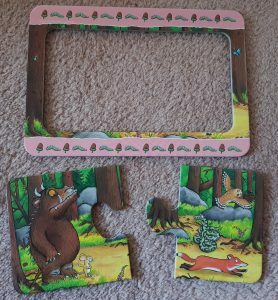 We do like to lay all the pieces out before starting, even though it takes time, but with this puzzle especially, it really paid off as we could pick out and assemble the small pictures quite easily. It also saves the frustration of someone coming past and putting the last few pieces in! As Ravensburger puzzles are so accurately cut, the pieces hold together well while you slot them into the main puzzle. I think the puzzle is great for a family group, as children will enjoy helping to sort out the small pictures and seeing them placed in the big picture; it will also stimulate their interest in history. The detail is amazing - the colours are sharp and clear and the images are top quality. It's good to know that purchases of this puzzle support the work of Historic Royal Palaces. Hampton Court is such an iconic and evocative place to visit - I visited as a child and my visit has always remained in my memory; now I want to revisit, stimulated by the puzzle and the accompanying factsheet. This superb puzzle really does bring the Palace and its grounds to life and it would be the ideal memento of a visit. A far cry from today's electronic office, the jigsaw shows a secretary in her 1960s office - and she even has an assistant to help her; those were the days! Just look at the typewriter! The puzzle is created by Trevor Mitchell, and it's packed with detail which really comes out as you assemble the puzzle. The bright colours mean that it's easy to pick out the right puzzle pieces, and the high quality cutting of the pieces means they click together positively - none of that frustrating 'I wonder if that's right'. Best of all - there are no huge areas of one colour which can get very boring. I like the fact there's a leaflet showing the picture, as I like to use the box lid for laying out the pieces. The completed puzzle measures 49.3 x 36.2cm. This is one in a superb series of nostalgic puzzles - the 500 piece puzzles take us back to work of many years ago, and the 1000 piece puzzles take a nostalgic look at places around Britain; they are a refreshing change from 'picture postcard' views. These really are puzzles to bring a smile to your face and will make perfect gifts for anyone of a certain age - and any secretary from the 60s will love to revisit the office; it will bring back lots of memories. For younger ones, they will be fascinate to see how we used to work. Ravensburger jigsaws really are excellent - the pictures are bright, colourful and always very interesting; the cutting is flawless and the pieces fit together to perfection. I hated breaking up the puzzle when I had finished as it was a great talking point with all its intriguing details of offices of bygone days - children were fascinated!. This lovely puzzle is packed with detail to keep everyone enthralled and engrossed. It is the first in the "My Haven" series, which depicts havens, sanctuaries and retreats; it's perfect for unwinding and for anyone who wants a bit of 'me' time. The puzzle depicts a craft shed full of creative activities - there are paints, fabrics, craft tools, ribbons, buttons and beads, pens and glues. Nestling in the middle of it all is a peacefully sleeping cat - and there's a cup of tea to hand as well. Outside is an idyllic garden. The image is created by British artist Steve Read, who is based in a seaside town on the south-east coast of England. This would be an ideal gift for anyone interested in creative hobbies and crafts.This 1000 piece puzzle measures 69.9 x 49.7cm when complete. All Ravensburger puzzles are top quality - the colours are vivid and the pieces are accurately cut so there's no putting pieces in the wrong place. The intricate detail of this one is superb - there is just so much to enjoy. Includes in-box A4 colour leaflet showing puzzle image for reference, information about the image and artist's biography. Wouldn't you just love a place like this to call your own? And just imagine the wonderful creations that would come from having such an inspiring place to work. The best jigsaw I have seen for quite a while. This bright and colourful 70 piece jigsaw makes up to a super-size 61 x 42cm - perfect for doing on the floor and big enough that two children can work on it together - recommended age 4-7. The picture shows a busy enchanted woodland, full of familiar characters and magical animal friends. There is so much to spot - the tea party, a little girl in a wheelchair feeding a deer, a girl and a fox dancing, ducks in the lily pond and lots more; it's a super picture, packed with detail. Children will have great fun putting together this fairytale party and spotting all the children and animals (fox,es, badgers, rabbits, mice and more) as they go. Children gain many benefits from jigsaws - they help hand-eye co-ordination, observation, concentration and imaginative play. This particular jigsaw is especially designed to help with conversation - once it is complete, use the included talkabout guide on the box to encourage discussion. These ideas are super - encourage imagination by guessing what the squirrel might be singing; support literacy by spotting objects beginning with m; play I-spy with objects in the picture are just some examples. It's a great way to extend the value of the puzzle and to make playing a really enjoyable experience for you and your child. You can buy the puzzle direct from Orchard Toys or from Amazon - Orchard Toys Woodland Party Jigsaw Puzzle (Multi-Colour) . Another winner from the ever-excellent Orchard Toys, as ever, well made, with pieces that fit together well and bright durable colours. Perfect for children looking for slightly more challenging puzzles. It's a great idea to have four puzzles of different sizes in one box, as it means the puzzles will offer your child fun over a much longer period that just one puzzle at a single level. It's great for siblings playing together, too, as each can choose a puzzle that suits their ability. The box contains four puzzles, suitable for age 3+ - a 12 piece, a 16 piece, a 20 piece and a 24 piece; each puzzle has a different coloured frame so it is easy to separate out the puzzles (you may like to put each into a separate bag when completed, for ease next time, as there's not a huge difference in the sizes of the pieces). As with all Ravensburger puzzles, the pieces are well cut and fit together firmly. The colours are bight and the pieces are durable; the pictures will appeal to all fans of The Lion Guard, of course, but the appeal is not limited to those who follow the TV series. The animals are appealing and playful and these lovely jigsaws will really be a hit with children. This 100 piece puzzle is perfect for storing in the Christmas box, ready to bring out year after year to delight young members of the family, along with visiting family and friends; it sums up the essence of Christmas. Raymond Briggs' The Snowman has become a Christmas classic The Snowman is a Christmas classic, loved by all ages. This seasonal puzzle shows The Snowman, Billy and The Snowdog meeting up with Father Christmas at the North Pole; there are plenty of other characters to meet too - a snowy geisha, a cowgirl and a character who looks a lot like Oliver Hardy. Alongside them is a brightly-lit Christmas tree, and there's a background of pretty fairground stalls, snow-laden trees and a starry sky; snow is falling on the scene. A tartan border with presents all around surrounds the scene. The puzzle measures 49.3 x 36.2cm when completed, and is in the XXL range, perfect for children of 6+. Ravensburger pride themselves on the careful cutting of their jigsaw pieces, which guarantee a perfect fit for every piece, time after time. I liked the non-glare look of the pieces - at this time of year, puzzles are often done under artificial light, so this makes a real difference. The pieces are durable, the colour intense and long-lasting, making this puzzle one that will give many happy hours; perfect for the family to enjoy together. This large (69.9 x 49.7cm) 1000 piece puzzle shows the beautiful city of London by night. The picture shows many of the iconic sights, including Big Ben, the London Eye, Westminster Bridge and County Hall, all beautifully lit and reflected in the River Thames, as well as many more tall buildings and popular tourist spots. As you assemble the puzzle you will, as we did, keep spotting yet another landmark. The large size of the puzzle and the high quality of the photograph means they are shown in plenty of detail. The puzzle has high quality pieces and uses Ravensburger's "Premium Puzzle Softclick Technology"; I like the fact there's plenty of variety in the shapes of the pieces so pieces go into the right place from the start; Ravensburger uses handcrafted tools which allow this versatility in shapes. The panoramic shape is easier to work with too - not so much stretching from top to bottom and we found it was ideal for two puzzlers sitting side by side. Passers-by will get drawn in to - it's so attractive and compelling to just find one more piece to finish a landmark. It will make a superb gift for anyone but would be especially good as a gift for visitors from abroad - or for ex-pats. Quite a challenge to put together but very rewarding - and you won't want to break it up; it's good enough to frame if you really can't bear to pack it away. This big, bright and colourful jigsaw is a fun way for children to learn the letters of the alphabet. The fun illustrations are really special and will provide lots of talking points - 'Who lives in an igloo? '; 'What's your favourite jam? '; 'Who might wear these hats?' and many more. This adds hugely to the learning value of the jigsaw - there's also a big poster, ideal for displaying on a bedroom wall or toy cupboard door. The chunky pieces are generously sized and slot together well; the thick card means they will be durable too. Jigsaws help children learn dexterity and also to persevere as they look for the pieces and slot them together. The back of the box has useful additional ideas to develop learning, including discussion, number skills (there are plenty of counting opportunities), recognition and encouraging literacy. A very attractive jigsaw with many learning benefits - but above all, it's fun to do. Children will have great fun with this extra-long floor puzzle - it's over 2 metres long! The colourful pieces are really well sized and so are perfect for little fingers to manipulate - but the really clever thing, which sets this puzzle apart from other alphabet puzzles, is the fact that the letter within each piece can be popped out. This extends play and learning value enormously. They can associate the letter with its accompanying picture, fit the letters into the shape and use the letters separately once they are becoming confident with alphabetical order. There is a slight problem when fitting some of the pieces together, though - not all the pieces slot together as easily as they should, there seems to be a little mis-cutting. And when the fun is over, the sturdy box with rope handle is all ready for tidying up and storage. This is an excellently thought out puzzle so hopefully, my slightly mis-fitting puzzle is a one-off. There is so much learning potential here - and plenty of fun too. Meadow Kids have a superb range of toys - do look at their website. This collection of four brightly coloured foam jigsaw puzzles includes one 2 piece puzzle, two 3 piece puzzles and one 4 piece puzzle. Add a bit of extra bath time fun with these clever puzzles which stick to the bath or tiles when wet and yet peel off easily after, leaving no nasty marks to wipe off. They are well made, in really thick foam that will be very long lasting and the bright colours look as though they will last really well too. They have a lovely satisfying feel and will be good to play with out of the bath too. Great for young Peppa Pig fans - especially when they have been playing in muddy puddles! This superb jigsaw puzzle is based on the hugely popular 2013 film Frozen from Disney and features the five main characters. It's really bright and colourful puzzle made to the very highest standards, which make it a real pleasure to use. Ravensburger puzzles pieces are perfectly sized for each age, so you can be sure you are giving your child an age-appropriate puzzle. The puzzle is made from thick, strong board and measures 49 x 36cm approximately once completed - all the pieces fit really well together, making this a satisfying puzzle to complete. Perfect for all Frozen fans. Wasgij (think about it!) puzzles are hugely popular with adults so it's great to see one designed for children as I have seen them fascinated by the adult versions. They really make you think in a whole different way - not quick to do but I guarantee it will be a rare person who will pass by and not stop to fit in a piece or two! Based on Dickens' famous character, children will love to see the Christmas favourite come alive as they use their imagination to build a picture which is not the one on the box. Although there are a few clues, it's really down to the puzzler. The lively picture will amuse and entertain and makes a great talking point. A fun and refreshing change for puzzle addicts. Children's favourites Mr Tumble and Aunt Polly are enjoying a tea party in this chunky jigsaw ideal for children of 18 months plus. Eight shaped jigsaw pieces fit snugly into the colourful baseboard, which also has coloured dots matching the coloured knobs on the pieces, so the puzzle is simple for little ones (the pack recommends 2+ but I found an 18 month old thoroughly enjoyed it, just beware of small parts). Jigsaws help develop hand to eye co-ordination, concentration and colour recognition so they are an important part of early learning. A high quality product which children will enjoy. This set contains 12 colour themed 5 piece jigsaws in primary and secondary colours, as well as black, white, grey and a multi-colour one. Each has 3 familiar objects in a single colour, plus the colour name and the colour. These first puzzles are recommended for ages 3 - 7 but I would suggest that younger children can enjoy them too - my 18 month old tester was spotting the familiar objects and handing them to her 3 year old brother to slot into place; a great example of co-operative play! As well as developing hand-eye coordination, colour and matching skills the jigsaws offer plenty of opportunities to extend play value - animal noises, which is your favourite fruit for example. As with all Orchard Toys, this is a real pleasure to play with - sturdy well-made pieces in bright durable colours, the games just last and last and look as good as ever for many happy sessions of play. I like the carry boxes with handles too - just right for little ones. Buy direct from Orchard Toys and look at all their other superb games and jigsaws, or buy from Amazon - Orchard Toys Colour Match . Pre-schoolers will love this bright and colourful 20 piece puzzle (one of a series of four) which is made in good quality card that will last through many re-makings without showing signs of wear or curling. Sofia is a young girl who becomes a princess when her mother, Miranda, marries King Roland II of the kingdom of Enchancia; she is the star of a popular series on the Disney Channel and children (especially little girls) will love to enjoy a puzzle based on the series. Jigsaws are a fun way to encourage the development of many key skills including concentration, shape recognition and hand-eye coordination so children learn while having fun. GoKi Wooden Frog Life Cycle Layer Puzzle - Four Puzzles in One! Featuring original Beatrix Potter illustrations of Peter Rabbit, this well-made wooden peg puzzle has different shaped pieces for numbers 1 to 6, and so it's a great way to encourage toddlers to learn their first numbers. Recommended for ages 18 months up, I think some one year olds would also enjoy this. The pieces have shaped wooden pegs so they are easy for little fingers to grip. Children can also trace Peter's path as he hops between the pieces. The pieces also help children recognise colours so all-in-all this is an excellent and attractive early learning product - an ideal gift. This really is eye-catching - the tiger seems to leap off the tin! This 3D Magna Portrait Puzzle Tiger, with its state-of-the-art design, incorporates a 3 dimensional depth that has not been seen before! The puzzle is made up from 32 vivid tiles with a 3d effect. It's stored in a metallic jungle-themed tin - you can choose to do the magnetic puzzle on the tin or perhaps on the fridge, where it will certainly be a talking point. It's quite a challenge to do - not only are all the pieces square but the 3d effect means the picture changes every time you look at it. It's very clever and makes it feel almost like a new challenge each time you do it. Unusual and very effective. And if you find this addictive, Cheatwell Games have lots more on their website, so do take a look. This is a beautifully crafted jigsaw which will look lovely on display in a child's bedroom as well as providing plenty of play value. It's an excellent way to introduce children to the alphabet and the chunky pieces which slot firmly together are very satisfying to handle. I am glad to see that the letters are lower case which is far better for recommended age of 3+. There are plenty of other opportunities to play with the pieces to help letter recognition too - look for simple words or your child's name (if no letters are repeated!). The dinosaur is handmade from sustainable rubberwood and brightly painted with safe non toxic paint. The overall size is 54 x 13cm. Lanka Kade supply fair trade wooden toys handmade in Sri Lanka. This would make a lovely gift - one to be cherished for many years; also available is a number dinosaur. Wooden toys make a refreshing change from the ubiquitous plastic and are a real joy to handle. Buy from Junior Scholars, who supply a wide range of educational products, specially designed to help children from 0 to 16+ reach their true potential. An aerial photograph of Paris - certainly quite a challenging puzzle (shame part of the picture is blocked by the iPhone image). Once complete, you can download a free app to your iPhone/iPad and (I am told) you will be magically transported to the top of the Eiffel Tower at night with the whole city is spread out before you; as you turn you'll get a 360 degree view of the city. And there's more - you can highlight key buildings and learn fascinating facts about them, accompanied by typical music of the atmospheric Parisian cafes. The puzzle pieces are well made and use soft-click technology - they certainly fit together easily and I am finding that they only fit into the correct places. I can't say that I have completed this jigsaw (yet!) but I will come back to this review when I have with my final thoughts! Much as I would love to try it out, it must wait so sadly I can't comment on the augmented reality app, but it's an intriguing idea and I am really keen to try it out. Can't wait! A clever wait to merge old and new technology and a real incentive to persevere - there are plenty more similar puzzles to enjoy too. They loved the book - now they can enjoy the 300 piece jigsaw based on Terry Deary's book. Terrible Tudors features Horrible scenes of a dirty, dangerous Tudor town which is depicted in all its gruesome detail. It's great to see the illustration in colour and the level of detail is fascinating - I love the variety of expressions in the audience for the actor. Plenty of yucky detail too - watch out for the chamber pots being emptied! There's such a lot to spot and if children haven't already read the book, I am sure they will be encouraged to do so and thereby heighten their interest in history. It includes an 8-page Loathsome Leaflet full of foul facts. It's a good quality puzzle too - it fits well together. Good fun for all the family - put it out on a wet weekend or a winter holiday and everyone will be wanting to help! I was sent this by Cre8iveKidz, who have a superb range of arts and crafts sets suitable for children of all ages - buy from Cre8iveKidz. They have the Rotten Romans jigsaw to go with this one. A generously sized puzzle for children of 5+, this is a super way to learn about the continents of the world. Each continent is a different colour (or two), so identifying the puzzle pieces is easy, and there are lots of animals depicted in their area. There are also little pictures of iconic buildings and native people. All this is an excellent stimulus for children to do further research. I like the fact this jigsaw comes packaged in a tin - it means that it can be safely stored away and can be used over and over again whilst retaining a smart appearance. It's ideal for classroom use, perhaps in the rainy day box. A colourful set of two puzzles which accompanies the Over in the Meadow book . One puzzle is 12 piece and the second is 24; the pieces for the 12 piece are larger and there's no problem about mixing the puzzles up as the border colours are different. I would keep the 24 piece puzzle aside (they are in separate bags) and give a young child just the 12 pieces first; then they can have the second puzzle and for even more challenge, mix them up. It's a great idea as puzzles can be expensive and this guarantees years of use. The patchwork style illustrations are charming and the packaging, complete with carry handle, is delightful. The first thing that strikes you about this puzzle is the super packaging - it's a colourful tube with a rope handle to carry it around. Inside, children will learn about the wonderful architecture that can be found around the world as they complete the 63 piece jigsaw. It's a bright colourful puzzle and an extra is the fact that the names of the buildings are around the edge to provide an extra learning challenge. The finished puzzle measures 14" by 18". It's a lovely way to stimulate an interest in famous landmarks and a great opportunity to encourage children to go on and do further research to find out more. Use it with an atlas to find out where in the world the buildings are. For ages 5 and up. These two fun puzzles are based on the popular singalong The Journey Home from Grandpa's. The larger (12 piece puzzle) shows a fire engine and crew, while the 24 piece puzzle shows a colourful digger. Link the puzzles with the book to get the full benefit and maximum enjoyment for your child - Journey Home from Granpa's Book & CD (A Barefoot Singalong). The jigsaws come in a colourful box with a handy carry handle - the attention to detail in these games is exceptional and they are a joy to play with. The inclusion of two levels of puzzle means they will have a useful life span too. Ages 3 and up. These are very first jigsaw puzzles and are perfect for introducing little ones to the fun that can be had from jigsaw puzzles. If they are familiar with the lovable Bear, so much the better as they will enjoy the puzzles even more. Join Bear as he travels from here to there on his bike - on a train - in a boat - on a spaceship. There are sixteen sturdy board pieces which fit together to create four pictures, so you can help your little one by separating them initially, and then let them sort out all the pieces once they get more skilful. All the games from Barefoot Books come in the most wonderfully colourful and appealing packaging, which make you want to investigate inside! This comes in a box with a carry handle. Jigsaws are great fun as well as being valuable for developing manipulative and observational skills. With this 12 piece set, which makes six pictures of friendly farmyard animals, you can start toddlers off enjoying jigsaws at a very early age. The pieces are large and made in sturdy card. Start off by giving your little one just the two pieces needed to make one of the colourful farmyard animals and as they mature, you can introduce more pieces at a time. Extend the usefulness by discussing the farm animals with your child and use the pieces for imaginative play. Buy from Orchard Toys.